From our Beaded Garland Collection of over 60 Beaded Garlands! : Perfectly stunning "White & Ivory Pearl" Beaded Garland is crafted of soft luminous faux pearls that have a sheen equal to the real thing! This has become one of our most popular garlands for weddings. The colors vary from a very pale ivory-white pearl to a shimmering white pearl. 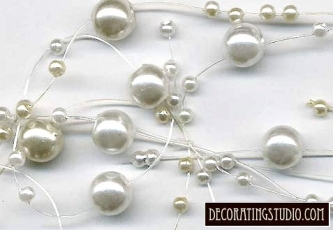 The slight variance in shades give this beaded garland an ethereal depth of design. Perfect for reception decor, party and event decorations.